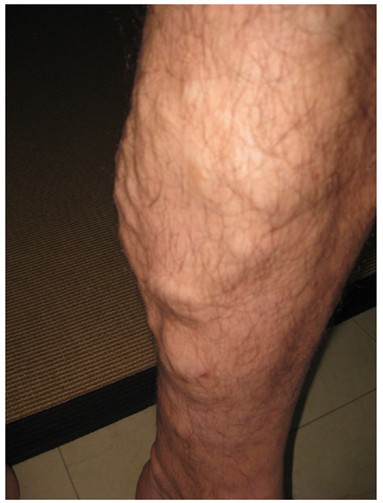 Large, bulging veins close to the skin's surface are often found in the lower legs and feet and are called varicose. Because we walk, stand and run on our feet, veins in our lower legs and feet receive quite a bit of blood pressure. Varicose veins can be more than a cosmetic concern since they impede blood flow and hinder the return of oxygen-depleted blood from the lower legs and back to the heart and lungs. The usual cause for this is damaged valves within the veins that allow backward blood flow and pooling of blood resulting in enlarged veins. Untreated veins can lead to serious medical conditions with associated pain, inflammation and discoloration. Ambulatory phlebectomy—small incisions or needle punctures are used to extract the problematic veins with a phlebectomy hook. A hook is inserted into a micro-incision in the leg. A section of the vein is hooked and then removed through the incision. With this procedure, a compression bandage is worn for two weeks. This minimizes swelling and discomfort and allows for proper healing. At Southern Vein & Laser Institute, patients will find a comfortable varicose veins treatment center to receive the latest varicose and spider vein treatment options currently available. Our staff ensures patients are given the best care available and that they are presented with a vast array of options when treating venous diseases.